Observations: In the Australian Bureau of Statistics’ survey on business innovation, the top reason businesses innovate was to produce greater profit1. This objective has become, and will likely remain, the most challenging goal for businesses for the period 2017-2025 for reasons this note will explain. It will not be central to IT, but it will be for business strategy. This objective will also impact other public sector organisations even though they do not have the same financial objective. Achieving profit involves various and sometimes a combination of factors: price, market share, competition, for example. It also entails greater analysis of data. Analytics packages associated with CRM have complemented the ability to investigate types of business data. Register leads and contacts in categories such as: customers, ex-customers, prospects, suppliers, partners, potential partners and inactive customers. Distinguishing customers into hierarchies depends on criteria which relate to different customer programs for each segment. Track all customer interactions which can be used to consolidate long-term relationships. CRM data reveals commercial possibilities: for example, prospect pipelines; contact values; behaviour and cross-selling; value and yield analysis. Customer data is a business asset. For some organisations CRM data on customers, stakeholders and suppliers may be assets on a balance sheet. While the list above is a reminder of the importance of CRM, CRM can be applied to a specific business environment. The context and application of business or market related technologies should highlight the value of such technologies at certain periods; for instance, within a business cycle, which tends to last for approximately 7-8 years. From 2017 there will be three reasons to ensure CRM and associated analytics are given attention and priority. 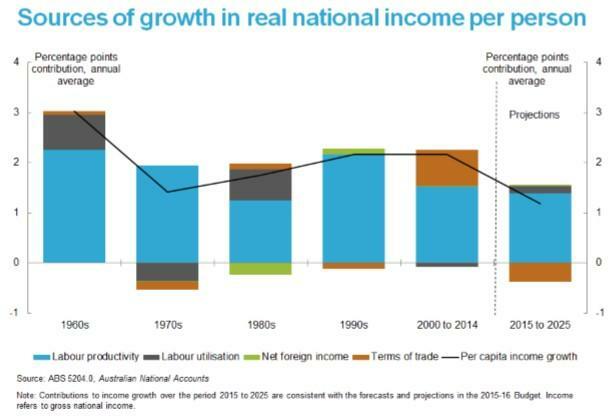 This is shown in the chart: sources of growth in real national income (less inflation) per person. The constituent elements are not vital to understanding the dynamic. The outlook is for a halving of growth over the decade to 2025. The growth rate is critical because it determines the amount, or stock, of income at any point in time. A reduction in the growth rate influences the incomes of individuals and businesses. The income flow passes as expenditure which becomes income to other sectors. 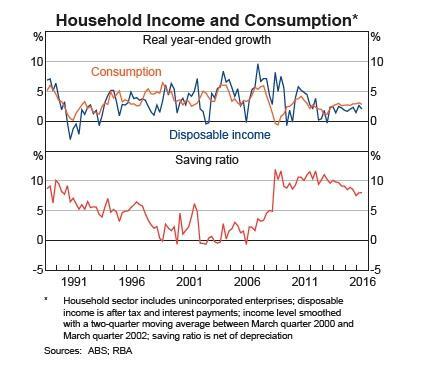 Household expenditure: The sensitivity of households and consumers to income pressures is examined every month by the RBA. The household income and consumption chart underlines the sideways movement of both measures since 2011. Savings ratios have fallen to make up the difference. Over time, up to 2020, this strategy will become more stretched and that will consequently affect consumption. 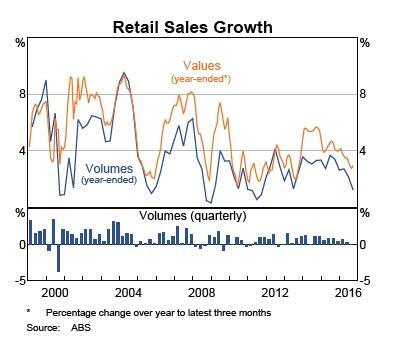 Likewise, retail sales growth is falling. Annual turnover is 2.8 % but the trend is a more important figure per month and is indicative of future prospects. The business sector is highly concentrated on the domestic economy and given the household income growth outlook, it is probable that the business to business sector will move sideways for a while. Identify the User/Consumer: The purpose of the CRM and analytics is to be able to target buyers efficiently. This is not as simple as it seems because consumers fall into discrete categories which analysis reveals. In the conditions described above, the most effective CRM will be able to target and reach the most profitable customers. In a market, prices are fixed by the buyer that is willing to pay the highest price. This buyer is the “marginal buyer”. The marginal buyer determines price levels and price stability and has a direct influence over the volatility of prices over time. Businesses tend to overlook the role of these buyers because price setting is assumed as a given and it is assumed to be fixed within quite long periods. That sanguine attitude may be partially accurate during buoyant periods but not in softer business environments. Vendors of CRM never acknowledge the role of the marginal buyer but they should because it would enable them to sell their products. Sales and marketing professionals take note of the marginal buyer when the price is uncompetitive. However, if a business does not identify this buyer, or niche, it loses its margins. The keen observation of all social media channels which marketers devote resources to, is an example of the marginal buyer being monitored. Although the term is not used in this context, it is the influence and attitudes of those consumers on social media which have market effects on volume and price. Even if actual purchase and price is not articulated, analysis will use proxies, such as favourable statements, endorsements or similar signs which suggest propensity to buy. Audit the availability and potential skill sets to make use of the data and its application within the organisation’s management.